This guided missile frigate, HMAS Melbourne (FFG 05), is an Adelaide-class vessel that is operated by the Royal Australian Navy since 1992. This frigate and the Newcastle were built by the AMECON, Williamstown. The initial designed armament for the frigate was a Mark 13 missile launcher configured to fire RIM-66 Standard and RGM-84 Harpoon missiles, supplemented by an OTO Melara 76-millimetre (3.0 in) gun. It also had a Vulcan Phalanx point-defence system. After upgrades in 2000’s FFG Upgrade Project, an eight-cell Mark 41 Vertical Launch System was installed, with a payload of RIM-162 Evolved Sea Sparrow missiles. In 2002, Melbourne participated in the third rotation of RAN ships to the Persian Gulf as part of Operation Slipper, where she enforced United Nations sanctions against Iraq. In 2003, the ship returned to Iraqi waters in support of Operation Catalyst, protecting Iraqi territorial waters following Operation Iraqi Freedom. 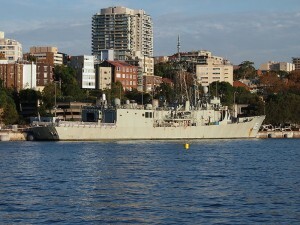 On 16 August 2010, Melbourne was deployed to the Middle East for the third time, again as part of Operation Slipper. Between 5 and 7 February 2014, while deployed off Tanzania, Melbourne seized and destroyed 575 kilograms (1,268 lb) of heroin from smuggling vessels.